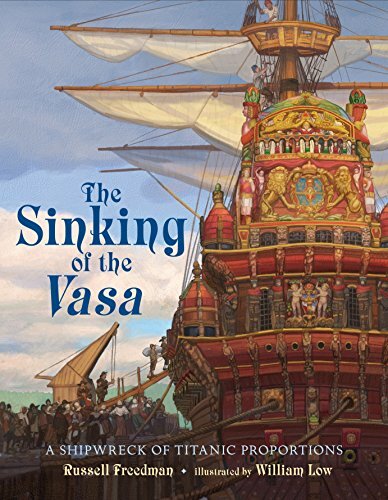 In 2015-16 I had the honor to work with author Russell Freedman on his final book The Sinking of the Vasa: A Shipwreck of Titanic Proportions. It was his first book under Godwin Books – Publisher Henry Holt and Co. and we were guided by Laura Godwin, VP and publisher of Godwin Books and editor and author extraordinaire. I’ve been working with Laura since we were both starting out in Children’s books. Since I love painting from life and live models and painting in the Vasa Museum in Stockholm was not a possibility, I build my own Vasa ship model from a kit. I used it to sketch out the most complicated views of the ship (before it capsized and sank in the harbor 1628). Normally, when working on an author’s manuscript, we don’t usually show layouts and ideas to the author. However, Laura and I wanted to work very closely with Russell. He was a award winning author and biographer (Newbery medal 1988) who had thoroughly researched the history of the Vasa ship for this book. Chances are, he might notice some things in my depiction of the ship! Russell saw the final book layout before he passed away in early 2018 and he seemed to be pleased. Russell was my english professor at the New School/Parson’s School of Design, so his approval meant a lot to me. Also, his extensive back list of over 47 non-fiction history books for young readers is an impressive portfolio, so my trust in him was absolute. The book was published in August 14, 2018 and is published by Henry Holt Books for Young Readers and sold by Macmillan.